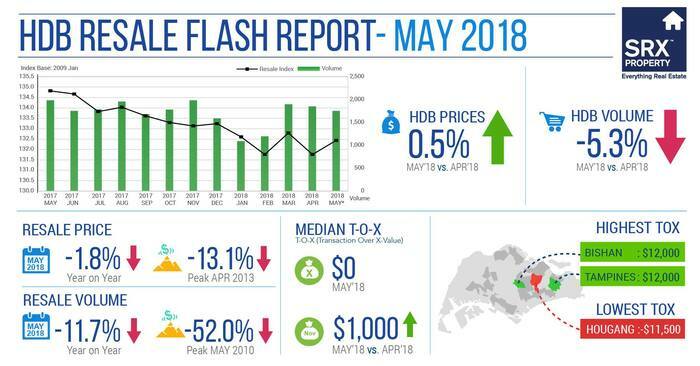 SINGAPORE - Resale prices of Housing Board flats rose 0.5 per cent in May from April, according to flash estimates released by real estate portal SRX Property on Thursday (June 7). Prices in May have dipped 1.8 per cent from the same month last year, and are down 13.1 per cent since the peak in April 2013. There was also a 5.3 per cent drop in the number of resale flats sold last month - to 1,753 units sold in May 2018 from 1,851 transacted units in April 2018. Resale volume was down 52 per cent compared to the peak of 3,649 units sold in May 2010. On a month-on-month basis, last month's resale prices of HDB four-room flats, five-room flats, and executive flats rose by 0.1 per cent, 0.5 per cent, and 1.5 per cent respectively. Meanwhile, resale prices of HDB three-room flats fell 0.1 per cent. In May, the overall median Transaction Over X-Value (TOX) was zero, up from negative S$1,000 in the previous month. TOX measures whether buyers are overpaying or underpaying compared with SRX Property's computer-generated market value. Flats in Bishan and Tampines looked to be in demand, with a median TOX of S$12,000 each. In contrast, Geylang and Serangoon posted the lowest median TOX of negative S$22,000 and negative S$8,000 respectively.